Hanoi Tomodachi House i Hanoi, Vietnam: Reservér nu! Tomodachi House is a Japanese style boutique hotel situated in a stimulating central area of the Old Quarter of Hanoi. It is well recommended for convenient location with very tiny distance to the main sights: just a 10-minute walk to Hoan Kiem lake, a 5-minute drive to Ho Chi Minh Mausoleum as well as Hanoi train station. Please reach us out at No. 5A, Tong Duy Tan Street, Hoan Kiem District, Hanoi, Vietnam. 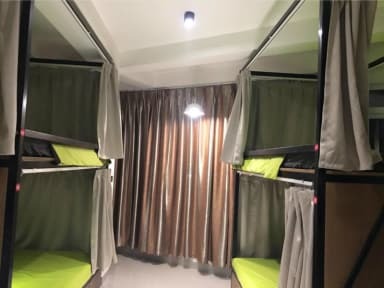 The hostel also provide TOURS (Ha Long bay, Sapa, Ninh Binh, Mai chau, Ha Giang....) to any palaces in VietNam, Guests can approach a 24 hours front desk with friendly and caring staff to be assisted with directions, tour/trip arrangements, currency exchange service, laundry and ironing services. There is also car/bicycle rental service for guests to get around the city more conveniently. Rooms are clean and fitted with comfortable beds, air-conditioning, a flat-screen cable TV and private bathrooms including a hot shower and toiletries. The hostel is a great choice for travellers interested in discovering the old and amazing Hanoi. 3. Both cash and credit card payment methods are acceptable upon arrival at the property. The woman in the reception was so helpful with anything. We booked two trips from the hostel and the woman called a lot of company’s to get the best trip for us. She recommended a lot so she was very helpful. It is a nice and quiet hostel with in a good condition.